Includes 9 Games for 89p. Redeem the codes via Steam. About this BundleDeep in the heart of South America, a new generation of Indie developers has risen through the ranks - now, we bring you their popular titles in one great collection! Witness addictive bunny-slaying in a bizarre mixture of real-time strategy, tower defense and 2D side-scrolling in Fluffy Horde; escape from an ever-moving deadly maze in Trip to Vinelands; and join a noble knight and his loyal gryphon on a quest to vanquish evil in Medieval shoot’em up Gryphon Knight Epic. Face an onslaught of enemies in brutal combat with a ‘Very Positive’ Steam rated duo UBERMOSH:BLACK and UBERMOSH:WRAITH - in which gamers must run, gun and hack their way through hordes of foes in top-down retro style action. 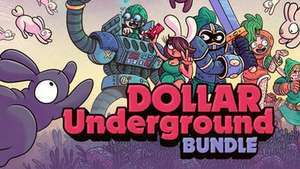 From using improvised equipment and experimental techniques to releasing highly-rated Steam games to millions - experience flavorsome titles from leading Indie developers now with the Dollar Underground Bundle, available for a limited time only!